Garnier Skin Renew Dark Spot Treatment Mask: I'm a huge sheet mask fan. There's just something so satisfying about pulling one out of the package and stretching it over your skin ... plus, they're perfect for travel! And every time I use this one, every blemish and spot on my face vanishes within 10 minutes. Seriously. Not to mention my skin just feels hydrated and soothed afterward. Garnier Skin Renew Dark Spot Hand Treatment: Not only does this hand cream sink into skin pretty darn quickly ... it's formulated with Vitamin C to help fade dark spots and Broad Spectrum SPF 30 sunscreen to protect your skin against harmful UV rays. Garnier Miracle Skin Perfector Anti-Aging BB Cream: There are so many BB creams on the market. Formulated to even, brighten and firm the skin, this is one you can trust. Garnier Moisture Rescue Refreshing Gel-Cream: One of my all-time favorite moisturizers! (Read my review here.) The combination of gel and cream sink immediately into the skin and rid it of any dryness in an instant. Garnier The Refreshing Remover Cleansing Towelettes: When I'm feeling a little too lazy to actually wash my face, I reach for my pack of these. They don't clog pores, they don't strip the skin, they just leave it feeling fresh and squeaky clean. Garnier Skin Renew Anti-Puff Eye Roller: You know those days when your eyes just don't want to wake up? They're feeling puffy, tired and anything but refreshed? That's what this little baby is for. This giveaway has a retail value of $65. To enter, use the Rafflecopter widget below. Good luck! This giveaway ends on Monday, September 2 at midnight. ONE WINNER will be chosen AT RANDOM on Tuesday, September 3 and notified by email. Maximum of SIX ENTRIES (one for each way listed above). Multiple entries will be disqualified. Giveaway is open to US residents only. Hair conditioner. It's just like the kind that comes in hair color kits! Love love love the Refreshing Remover Cleansing Towelettes! I like the Hydrating Eye Roll-On. I have been eyeing that Dark Spot treatment! Definitely the Anti-Puff Eye Roller--saves my eyes every morning! I love Garnier Moisture Rescue Refreshing Gel-Cream. Feels good on the skin. I like the anti-puff eye roller. The Anti-Puff Eye Roller! LOVE it! 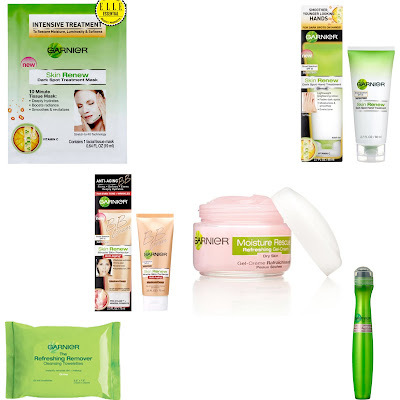 My favorite is Garnier Moisture Rescue Refreshing Gel-Cream. I like the BB Cream and the Moisurizer! Their BB cream is amazing! Honestly I've never tried it, but I'd love to! This summer I fell in love with Garnier's BB cream. Just enough coverage without feeling heavy or melting off my face. I love their face washes... they are so great! My favorite is their BB cream. It's not too heavy and moisturizes and gives light coverage. Makes getting ready in the morning much easier! I love their BB creams! I love their BB cream and Refreshing facial wipes! I like the cleansing towelettes for when I am too lazy to wash my face. Love the moisture rescue gel cream! Good stuff! BB cream for oily skin. The Oil Free BB Cream is nice. I like the towelettes because they are super convenient, but I never tried the BB cream from Garnier! I love the Garnier Skin Renew Anti-Puff Eye Roller! It's a miracle product! Love the Garnier Moisture Rescue Refreshing Gel-Cream! Garnier eye de-puffer works wonders. I love the Refreshing Remover Cleansing Towelettes! As a working mom and harried housewife, sometimes I just don`t have time to take care of my skin! These are a breeze and makes me feel like I pampered myself! I love the towelettes the most. So easy after a loooong day. Love the anti-aging BB Cream. Just love the Garnier Moisture Rescue Refreshing Gel-Cream. And just about every Garnier product! Do you know I have never used Garnier except for hair products; hair color shampoo and conditioner. Like them. But I need to try their beauty line. BB cream! I need something not heavy for everyday use! My favorite Garnier product so far is the Garnier Nutritioniste Refreshing Gel Cream. So light and moisturizing - awesome! I love the Dark Spot Corrector. It's kind of a tie...I use the eye roller, cleansing wipes, and BB Cream everyday! I use the cleansing wipes and they're PERFECT! Garnier The Refreshing Remover Cleansing Towelettes.